...you return from a wonderful weeklong boat trip on the Rhine river, through Germany and France, with only one souvenir: a Kugelhopf baking pan. Today, I baked my first ever Kugelhopf. The original recipe came from here http://www.thefreshloaf.com/node/19577/gugelhupf. I modified it slightly. In mixer bowl, combine flour, sugar and yeast; whisk to combine. Add eggs, water, milk and lemon zest. On low speed (KAid speed 1) combine until well incorporated; increase speed (KAid speed 2) for 2-3 minutes. Cover and rest for 20 minutes. Add salt and continue kneading (speed 2) for seven minutes. Scrap bowl occasionally. Add butter in thirds, combining each third on low speed until butter disappears. Increase to moderate speed (KAid speed 4) and knead, scraping bowl occasionally, until dough just begins to clean the bowl’s sides (about 10 mins.). The dough will be very wet and sticky, but satiny. Collect into a coherent mass in the mixer bowl, cover and rest in refrigerator for 1 hour. Stretch and fold in bowl, degassing vigorously. Return dough to refrigerator, covered for one-and-one-half to two hours, until it doubles in bulk. While dough rises prepare the pan by liberally coating inside with soften unsalted butter, sprinkling brown sugar of entire inside. This brown-sugar and butter mixture will caramelize, giving the cake’s exterior a delicious color. Transfer dough to Kugelhopf pan, or Bundt pan, filling to slightly more than half. Cover, and allow cake to rise until slightly below the pan’s top edge. Remove from oven, and let cool in the pan for about five minutes; then remove from pan. Let cake cool completely. Brush the cooled cake liberally with the sugar glaze. Let it dry until tacky; then sprinkle with granulated sugar or powdered sugar. Overall, I'm pleased with the result. I had a little dough left over that I baked in a tube pan, glazed it like the one pictured, and tasted it. Crumb is moderately closed, light and airy, with a nice spring but no chewiness. flavor not overly sweet. I made the dough entirely with King Arthur AP flour. I didn't want to run the risk of a "chewy" loaf. The picture loaf is going to a dinner party tonight, so no crumb shot. I'm going to do another in about ten days, for another dinner party, but will do a 60% high gluten flour, 40% chestnut flour, and incorporate brandy soaked currants, and chopped, roasted chestnuts. Since the party's at my house I'll post a crumb shot of that version. Along with bread baking, and travel I've two other hobbies (obsessions?) that compete for my time--as do naps. Retired, every day is Saturday, except Sunday, but I don't wish to replicate the pressures and stress I once experienced in the workplace, so I've developed the skill of doing nothing (except maybe reading) without guilt! At the moment finishing a new sewing machine cabinet/worktable for my wife, and learning new skills of charcuterie--about to take on dry-cured, cold-smoke sausages--bread baking is merely at maintaining the status quo; i.e., baking a couple of sourdough loaves and baguettes for our consumption. My wife makes the sandwich breads. 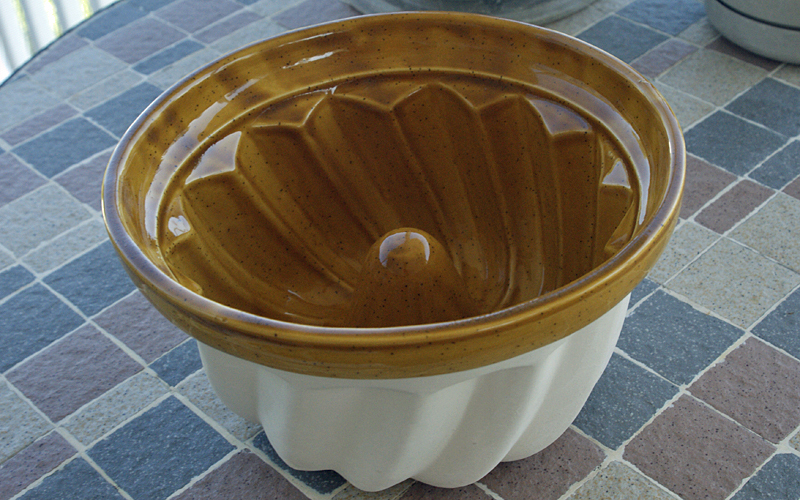 both the stoneware bowl and the 'very' delicious looking kugelhopf! Sounds like a wonderful trip! 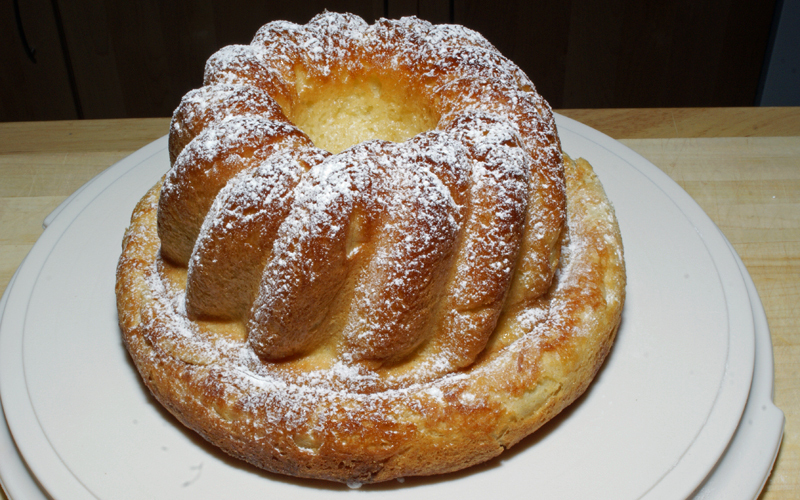 Nicely written recipe, one day I would love to try a kugelhopf, so I have added it my 'favorites'. Thanks, David. I found a wide variance in Kugelhopf recipes, both yeasted and unyeasted. This one seemed a good place to start. It was a hit at last night's dinner party. I left the remains with our hostess, who said. "Say goodnight. I'm going to have another piece as soon as you leave!"